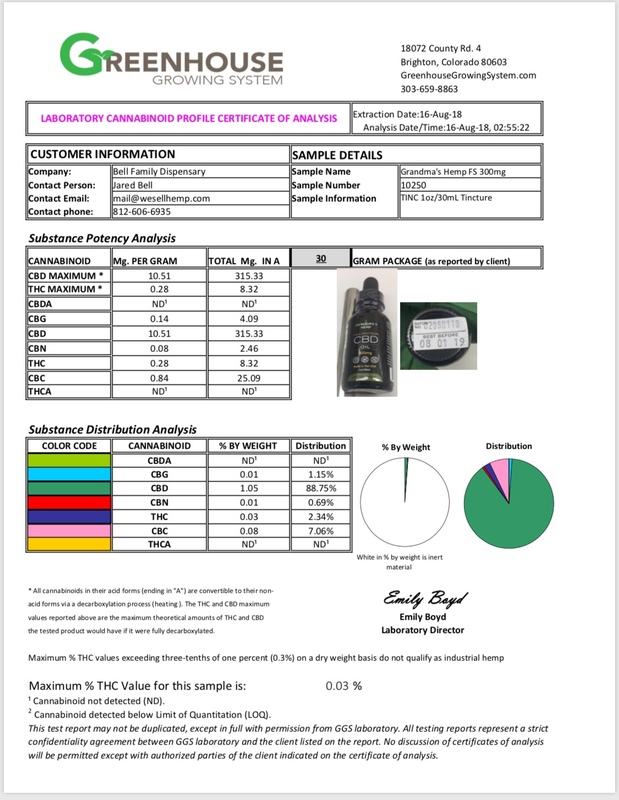 At Bell Family Dispensary we take great pride in the high quality our brand represents. In doing so, we make every effort to be as transparent to our customers about our products. 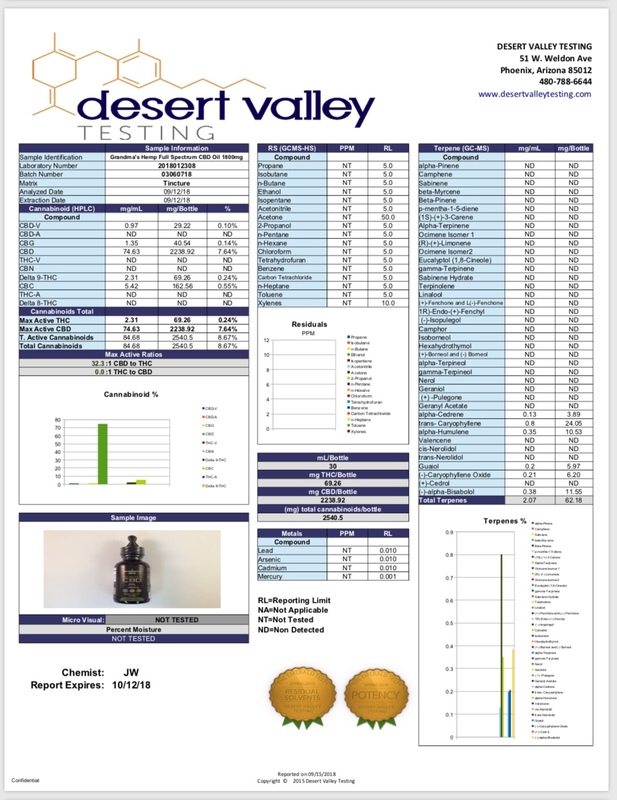 Part of that transparency includes detailed third-party lab testing. 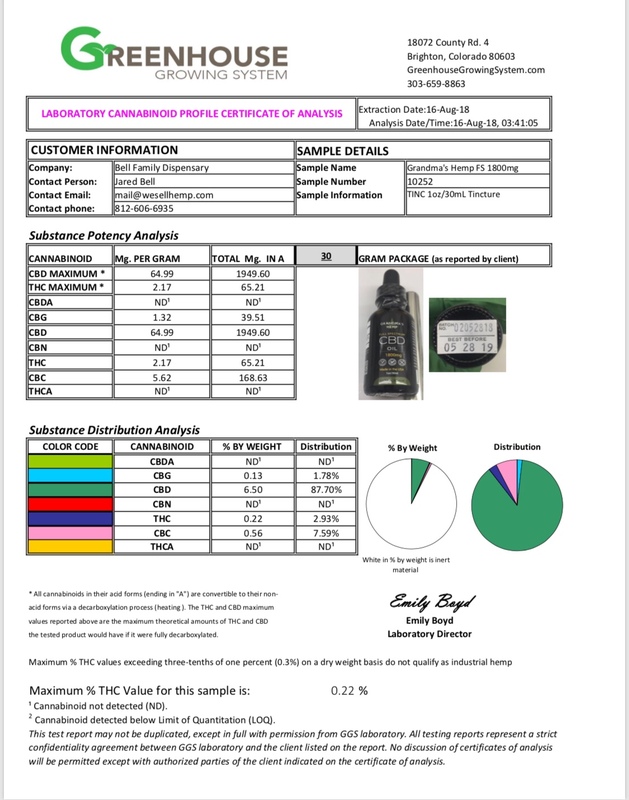 On this page, you will find links to testing results for our entire line of Grandma’s Hemp CBD products. 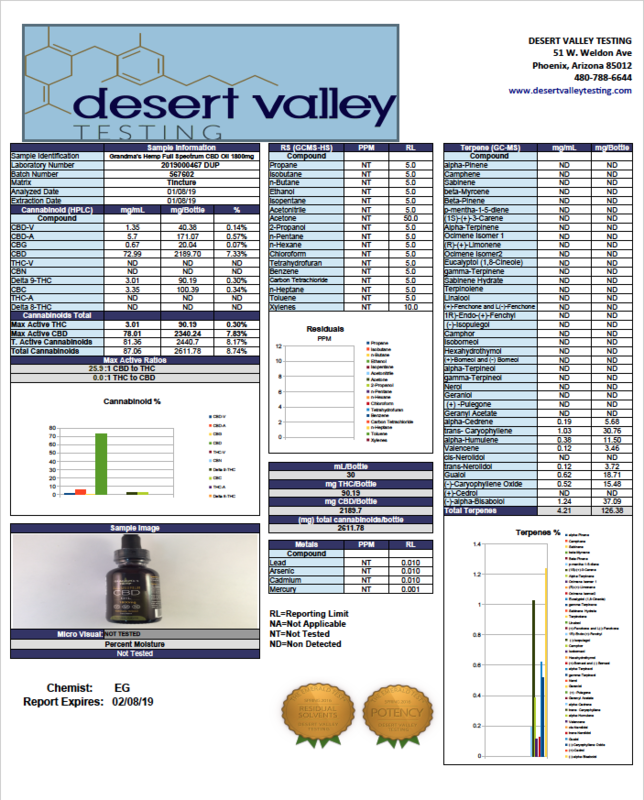 Click on the product to view each report. Ingredient: Fractionated Coconut Oil (MCT Medium Chain Triglycerides), Non GMO Sunflower Lecithin, Full Spectrum Hemp Oil. 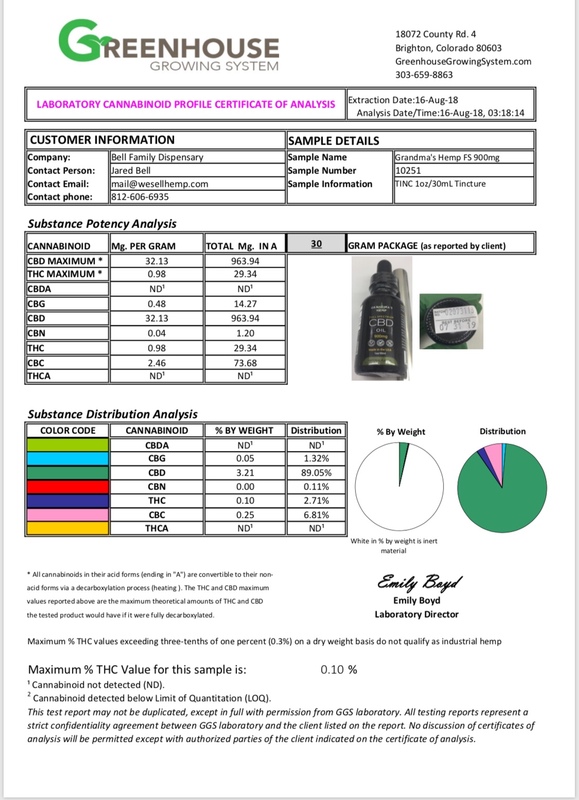 Ingredient: Fractionated Coconut Oil (MCT Medium Chain Triglycerides), Non GMO Sunflower Lecithin, Gelatin (gelatin capsule), Full Spectrum Hemp Oil. Ingredient: 100% Organic Essential oils [Lavender, Cannabidiol, Sodium Bicarbonate, Citric Acid, Cornstarch, Epsom salt, Coconut Oil, Natural Colors. Every CBD or Hemp product we carry has been 3rd Party Lab tested and verified that it’s below 0.3% delta-9-tetrahydrocannabinol (Δ-9-THC) Required by State and Federal Laws. We also only buy from vetted vendors or directly from the farms themselves. THCa or total THC does not matter as it’s still in its acidic “a” state, so psychoactive properties have not been activated. INDUSTRIAL HEMP —The term ‘‘industrial hemp’’ means the plant Cannabis sativa L. and any part of such plant, whether growing or not, with a delta-9 tetrahydrocannabinol concentration of not more than 0.3 percent on a dry weight basis. For the complete language of the Farm Bill, please click here. 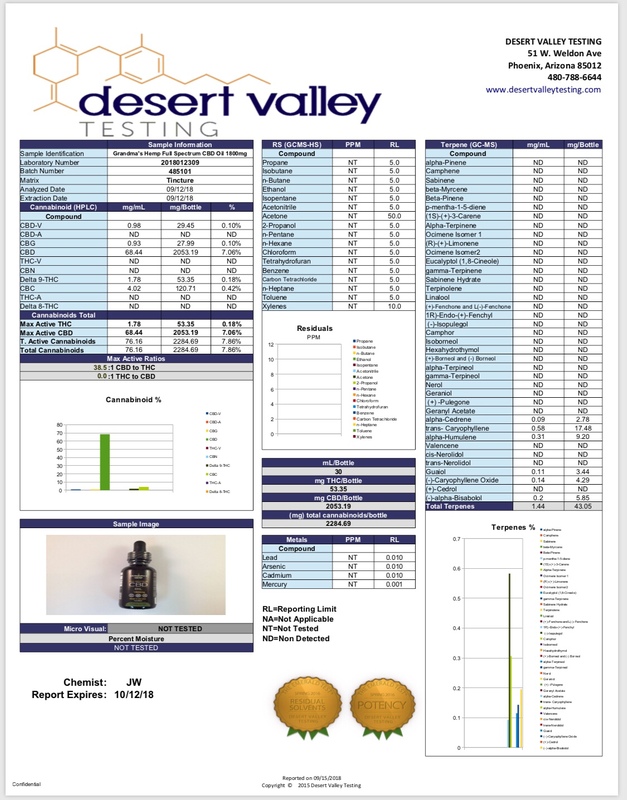 Again, this has been a big learning curve for CBD Hemp flower farmers, government agencies, CBD flower retailers and online customers. The more education we have on this topic the better.